Mt. Laurel resident Andrew Goren began his acting career at age 6 while taking lessons at the Walnut Street Theatre in Philadelphia. Today, his dedication to the art of theater has landed him a leading role in Paper Mill Playhouse’s Summer Musical Theater Conservatory. Each year, the Paper Mill Playhouse, one of the country’s leading regional theaters, puts on a fully produced, original show for its main stage as part of a ticket subscription package. This year, hundreds of the region’s best performers ages 10 to 18 tried out to be a part of the production, “New Voices of 2016: Everything Old Is New Again!” Only 120 of these performers were selected to perform in the three sections of the show. After first auditioning for the Conservatory and later the five-week summer program, Goren was selected for involvement in the section of this performance dealing with a variety of song and dance representing pop songs that later inspired Broadway musicals. His role is a significant part of this section, and much of it is built around his movement and acting. 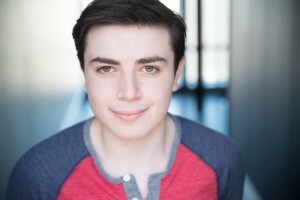 The 17-year-old Goren admits his mentor, Rob McClure, who is starring in “Something Rotten” on Broadway, has been a great inspiration. McClure is one of many Conservatory affiliates to later land Broadway roles. Other well-known Conservatory alumni include well-known actresses and actors Anne Hathaway, Shanice Williams, Liza Minnelli, Tony Roberts, Patrick Swayze and Nick Jonas. By surrounding himself with other successful performers and instructors, Goren has been given the chance to explore who he is as both an actor and singer, as well as to expand his boundaries in a safe environment. Although he feels the most challenging part of acting is being honest with himself to stay grounded in realism and to more deeply connect with the audience, the experience he has gained through his involvement with the Conservatory has provided him with a newfound appreciation for hard work and teamwork that will stay with him as his career progresses. Through his recent endeavors, Goren has learned that living your passion is better than anything else one can do in life. From attending Sesame Street Live as a child to performing in theaters himself, Goren is quite literally setting the stage for a bright career. “You must always believe in yourself to accomplish your goals,” Goren said. He will perform in “New Voices of 2016: Everything Old Is New Again!” on Friday, July 29 at 7:30 p.m. and Saturday, July 30 at 1:30 p.m. and 7:30 p.m. at Paper Mill Playhouse, located at 22 Brookside Drive in Millburn. Tickets range in price from $25 to $45 and may be purchased by calling (973) 376–4343, online at www.papermill.org or by visiting the Paper Mill Playhouse Box Office.